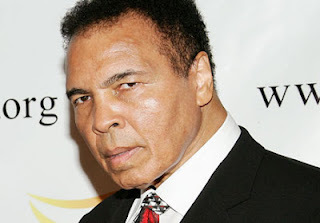 Historical Importance of Muhammad Ali: Muhammad Ali is one of the most famous boxers of all time. His conversion to Islam and draft evasion conviction surrounded him with controversy and even exile from boxing for three years. Despite the hiatus, his quick reflexes and strong punches helped Muhammad Ali become the first person in history to win the heavyweight champion title three times. At the lighting ceremony at the 1996 Olympics, Muhammad Ali showed the world his strength and determination in dealing with the debilitating effects of Parkinson's syndrome. 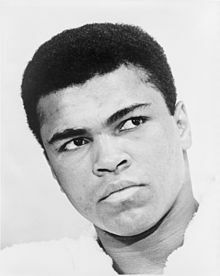 Muhammad Ali was born Cassius Marcellus Clay Jr. at 6:35 p.m. on January 17, 1942 in Louisville, Kentucky to Cassius Clay Sr. and Odessa Grady Clay. Cassius Clay Sr. was a muralist, but painted signs for a living. Odessa Clay worked as a housecleaner and a cook. Two years after Muhammad Ali was born, the couple had another son, Rudolph ("Rudy"). From the very beginning, Muhammad Ali took his training seriously. He trained six days a week. On schooldays, he woke early in the morning so that he could go running and then would go workout at the gym in the evening. When Martin's gym closed at 8 pm, Ali would then go train at another boxing gym. Over time, Muhammad Ali also created his own eating regimen that included milk and raw eggs for breakfast. Concerned about what he put in his body, Ali stayed away from junk food, alcohol, and cigarettes so that he could be the best boxer in the world. As Muhammad Ali started fighting in professional boxing bouts, he realized that there things he could do to create attention for himself. For instance, before fights, Ali would say things to worry his opponents. He would also frequently declare, "I am the greatest of all time!" Often before a fight, Ali would write poetry that would either called the round his opponent would fall or boast of his own abilities. 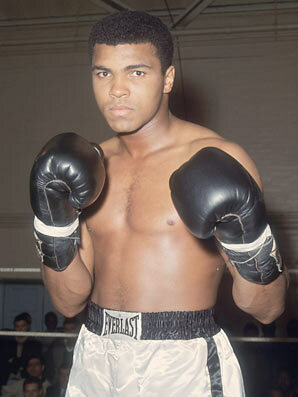 Muhammad Ali's most famous line was when he stated he was going to "Float like a butterfly, sting like a bee." The day after the championship bout with Liston, Muhammad Ali publicly announced his conversion to Islam. The public was not happy. 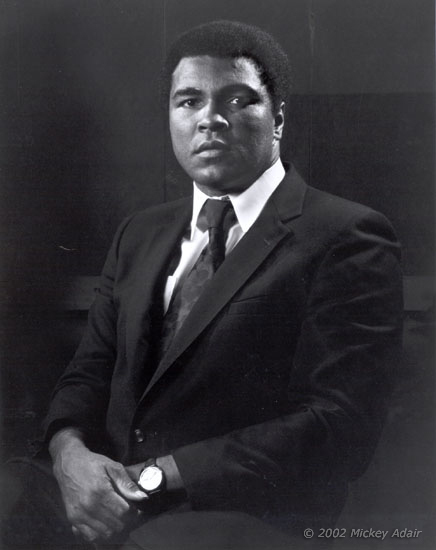 Ali had joined the Nation of Islam, a group led by Elijah Muhammad that advocated for a separate black nation. Since many people found the Nation of Islam's beliefs to be racist, they were angry and disappointed that Ali had joined them. For three and a half years, Muhammad Ali was "exiled" from professional boxing. While watching others claim the heavyweight title, Ali lectured around the country to earn some . After participating in an exhibition match on September 2, 1970, Muhammad Ali fought in his first real comeback bout on October 26, 1970 against Jerry Quarry in Atlanta, Georgia. During the fight, Muhammad Ali appeared slower than he used to be; yet before the start of the fourth round, Quarry's manager threw in the towel. Ali was back and he wanted to reclaim his heavyweight title. The bout was held in Kinshasa, Zaire and was thus billed as "the Rumble in the Jungle." Once again, Ali used his rope-a-dope strategy - this time with much more success. 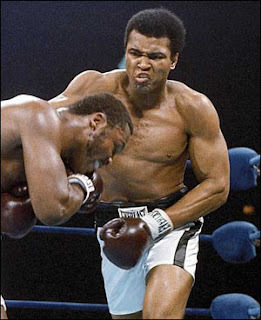 Ali was able to tire out Foreman so much that by the eighth round, Muhammad Ali knocked Foreman out. 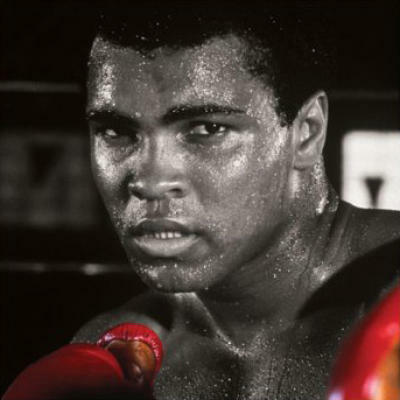 For the second time, Muhammad Ali had become the heavyweight champion of the world. Their third match against each other was held on October 1, 1975 and called "Thrilla in Manila" because it was held in Manila, Philippines. The fight was brutal. Both Ali and Frazier hit hard. Both were determined to win. By the time the bell for the 15th round was rung, Frazier's eyes were swollen nearly shut; his manager wouldn't let him continue. Ali won the fight, but he himself was badly hurt as well. After the Frazier fight in 1975, Muhammad Ali announced his retirement. This, however, did not last long as it was just too easy to pick up a million dollars here or there by fighting one more bout. Ali did not take these fights very seriously and became lax on his training. On February 15, 1978, Muhammad Ali was extremely surprised when novice boxer Leon Spinks beat him. The bout had gone all 15 rounds, but Spinks had dominated the match. The judges awarded the fight - and the championship title - to Spinks.